Preheat oven to 180°C. Place the bread slices on an oven tray. Drizzle with oil. Bake in oven, turning occasionally, for 5-7 minutes or until lightly golden and crisp. 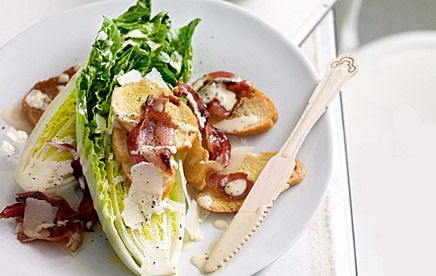 Place the pancetta on an oven tray and bake in oven, turning occasionally, for 5 minutes or until crisp. Remove from oven and set aside to cool completely.